It’s with some trepidation that I dub this a recipe for ‘Scottish Oatcakes’. You see, it isn’t entirely clear what fat should be used to bind a traditional Scottish oatcake, but it almost certainly isn’t olive oil. Everyone appears to hold differing opinions and methods, but the flavour of olive oil and the crispness it brings really does it for me. Honestly, these are so far above what you find in the supermarket you’ll never revert. Scottish oatcakes are fantastic; enjoyably rustic, they are disproportionately filling and, if made according to this recipe at least, possess a really delicious flavour. Oatcakes are also incredibly versatile and work as well in a cheesecake as they do layered with cheese and pickle. As you can see, my favourite way to prepare Scottish oatcakes is with a hefty pinch of pepper and a generous glug of olive oil. Trust me, though simple these ingredients possess an awesome depth of flavour. Your after-dinner cheese and biscuits or lunchtime snack will never be the same again. If you’ve never even heard of them, you must give this recipe a whirl. Take half of your porridge oats and tip them into a food processor, along with the salt and pepper. Whiz until relatively fine and tip into a mixing bowl. Add the remaining porridge oats into the mixing bowl, stir briefly and pour in the olive oil. Incorporate the olive oil a little before pouring in a little boiling water – around 2-3 tbsp – enough to transform your oats into a soft, malleable dough. Gently knead your dough for 30 seconds, turn out onto a lightly floured surface and roll gently until 5mm thick. 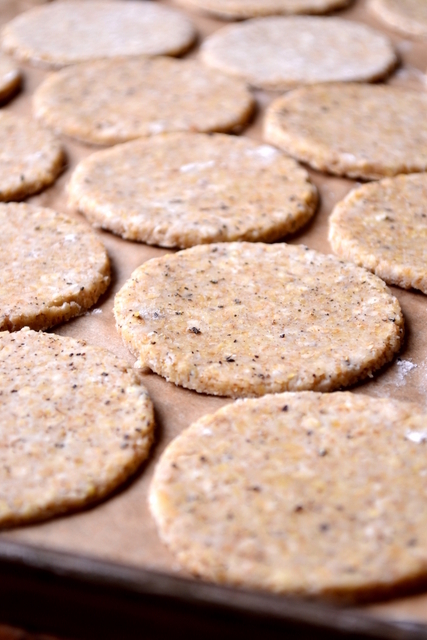 Take a 6cm round cutter and cut out 18-20 oatcakes. Preheat the oven to 160C/180C(fan). Pop the oatcakes onto a lined baking tray and bake for around 15 minutes, until they are crisp and a little browned. Cost: Let’s face it, oats are cheap. The most expensive ingredient is the olive oil. This recipe is cheap. 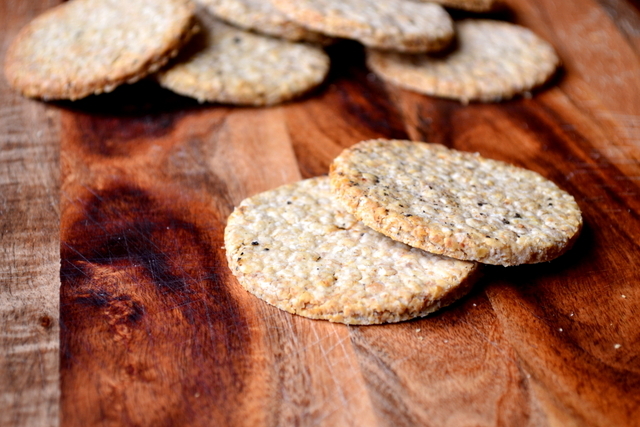 Indeed, this batch of delicious, olive-infused Scottish oatcakes should set you back no more than around 25p. Your recipes nearly always wow me (only exception being meat ones since I don’t eat it, luckily meat is pricey and you don’t go there much), but your food is imaginative and I know the recipes to be delicious. Thank you so much! Well, that seems to be a glowing endorsement! I really should do a meat dish soon – I barely eat the stuff any more though. Definitely going to give this a go, they look fab, and I love oatcakes. I can’t imagine why I haven’t made these before. Thank you. I don’t know why I waited so long either. These look fabulous, I noticed there is no sugar in them, can you go sweet or savory with the toppings? Well, oatcakes do tend to be savoury rather than sweet. But, yes, tey would work with a sweet topping. I love oatcakes with avocado as a snack. I’ve never actually made them myself though but these look great. You should, much nicer than shop bought. I’ll have to try them with avocado. They look excellent! Love all things oaty, don’t think I have ever tried making a proper oatcake – one for the list of spring baking for me – thankyou! Thanks, Joanna! I think you’d definitely enjoy these and they’re simple. Far simpler than all that amazing bread you bake. The quality of oatcakes varies so much. Some at the lower end of things tend to taste like cardboard. These look lovely. Yes, I find that. Much safer to make them yourselves! I’ve always wondered how to make these and have bookmarked this post for a baking project when the weather finally cools down a little. Thank you. Awesome – they’re really simple and quick. A great snack for the week. I’ve never had oatcakes but am always looking for portable snack-like things to add to my repertoire. Definitely making these soon! 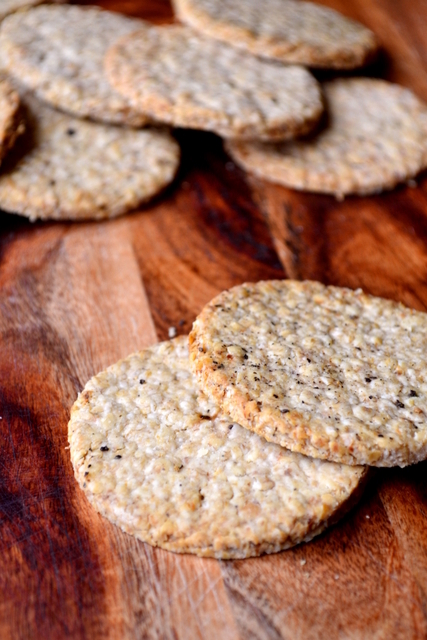 You should – they are incredible oatcakes! hiya have you tried making them with oatmeal? or is blitzed porridge oats best? I’m sure oatmeal is fine – it’s more or less the same thing I think! I look forward to giving this recipe a try sometime. Look lovely, great photos as always! G.
Just made these with caraway seeds (my current crush) and they turned out amazingly delicious. I’m going to make some more son – I really enjoyed them. Glad you gave them a go! These seem so simple to make, there is no excuse to ever buy them again! Gorgeous, gorgeous, gorgeous. I love oatcakes and good cheddar together and these look like perfection. Thank you, Daisy – I adore oatcakes and a good cheddar. I made these yesterday and they are just fabulous! I decided to grind my own peppercorns and the taste was just scrumptious; very peppery. Not long ago I had tried a different recipe but it couldn’t compare to this. I do like the fact that this recipe is all oats and not partly flour. 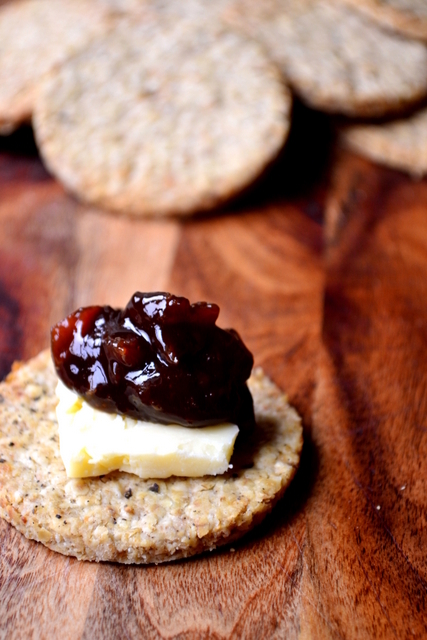 So wonderful with a bit of cheddar and some home-made chutney, or just on their own for a snack. Thankyou! This is the recipe I have been looking for for Oat Cakes, but…what are ‘porridge oats’ – are they what we call steel cut oats in the US?…. I’m not entirely sure, but I guess they must be. Sorry for the late response. Have been looking for a recipe for these, thanks a million for showing me how simple the are to make! MY pleasure – they’re actually very simple. Just made these little beauties and they taste gorgeous, much nicer than the shop bought ones. Mine have turned out really crumbly though (fall apart when I pick them up) what did I do wrong? What can I do differently? Please help. Want to make them again…. That’s strange. It’s difficult to say since mine turned out just fine from the same recipe! Try again perhaps? Sharon, this reply is years later, but perhaps the dough needed more hot water. I love oatcakes, and these turned out very well. A really easy recipe, except for the rolling out. I found that the dough broke very easily, a bit like rolling out really short pastry for mince pies. But I persisted, and I’m glad I did. Thank you so much for the recipe, especially as it contains olive oil and not butter. These are the best oatcakes I have ever tried. I am making 140 for my daughter’s wedding next week to go with her cheeses in the evening. Thank you – I hope everything went ok! Hi. Mine are very crumbly too. I’m using rice bran oil (because it’s cheaper) rather than olive oil. Do you think that would make much of a difference? I’m unsure – probably not. Mine weren’t at all crumbly. very strange. I’ve been looking for an easy oatcake recipe that didn’t involve a trip to the organic food shop for pinhead oatmeal plus organic rolled oats and other expensive nitems. This is a treasure, and although I left out the pepper .personal taste..its so quick, easy and yes, frugal, that I have made it once a week for the last month and have them for a fast healthy brekkie with a bit of cheese. Five stars! Thank you – what a review! Glad you enjoyed them so much. You know, I haven’t made them in ages – that needs to change. fantastic recipe, these turned out perfect. Thanks for shjaring. Have you ever frozen these ? We are traveling,and I would love to take with for breakfast ? Or how long would they stay fresh ? We are going to try the recipe this week based on your array of great reviews. Another reason for not buying shop-made is that many contain palm oil. I loved the idea of this recipe but the oatcakes just fell apart! is this because i used rapeseed oil instead of olive oil? other than that i followed recipe to the letter…..
Just made these oatcakes & they were lovely.did add a little more oil & water to bring it together. Being Scottish I am very fussy with my cakes but will make them again. Thank you. Looking for healthy snacks I though I’d give these a try. Very tasty indeed! However as an inveterate fiddler I made a slightly larger batch and split it between a third plain (anything but! ), a third with a handful of mixed seeds and some finely grated cheese in the rest (Gruyere, but I guess any would do). Slightly less frugal, but all very tasty. Thank you for the inspiration. Brilliant recipe. All commercial oatcakes eem to use sunflower oil – which I cannot eat. Your recipe is spot on. Great taste and texture, but very salty, half a teaspoon would be ample! I just made them and they are delicious and delicately crunchy. I wonder if you have a suggestion to make them a bit more sturdy? Would it be more oil or more water? Mine are delicious but they break up very easily so would not be good to transport. Any advice welcome. Thank you, thank you for this recipe. I can no longer eat wheat and wanted a recipe for oatcakes so I didn’t have to keep buying boxes of Nairn’s! These are easy beyond belief, beautifully rustic, and delicious. I added coarse black pepper and some cayenne, and look forward to trying out other seeds and spices in the mix. Those who found the dough crumbly may want to try adding a bit more hot water and letting the dough sit for longer to absorb it. Just made these with my 4year old son. SO GOOD! Perfect with our lambs liver pate and some stinky cheese! hi. Used steel cut oats. Did not work. I believe some of the oats need to be ground to flour in order for the mixture to stick together. I guess my food processor did not grind it fine enough. Rolled oats would have been better, with some steel cut for rusticness (no such word). Thank you very much for this. Having seen so many recipes demanding only oatmeal, which I can’t get where I live, it was great to see this recipe, and then find out that the result really is delicious oat cakes. I found I needed more water to get the dough, and some people might like to tone down the pepper a touch, but first time out of the oven they taste delicious, so bravo to you. Hello! 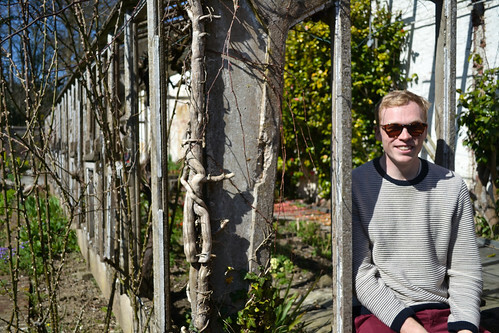 Nice to meet you; I'm Nick, frugal food enthusiast and curator of frugalfeeding, a food blog about eating good, well-sourced food as economically as possible. Cheap isn’t a word we use here.